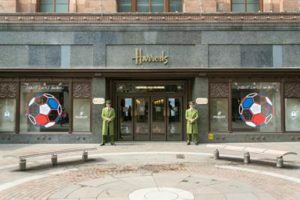 Harrods, London, 25th of May – It was a particularly multi-faceted celebration that occurred yesterday in the world’s most famous department store, Harrods. As the official Timekeeper of the FIFA World Cup™, the Swiss luxury Manufacture Hublot beat the drum counting down 20 days to go before the commencement of the FIFA World Cup Russia™. Not only did Hublot unveil its new dazzling football installation along the iconic Hans Crescent windows and within the Door 5 atrium, but Hublot CEO, Ricardo Guadalupe, also announced that the Brazilian footballer, David Luiz was joining the Hublot family as a Friend of the Brand. David Luiz well deserves his “Champion” title: he has an illustrious career in football having represented his home country of Brazil more than 50 times and winning the UEFA Champions League in 2012 with Chelsea FC. The Hublot family is abundant with many football champions – Champions who Hublot decided to pay tribute to through a Worldwide and inspiring communication campaign named: “The Champion Advice”. 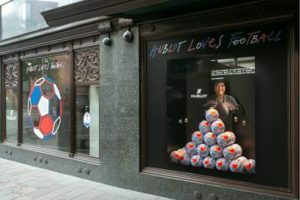 Among the 13 living legends featured in this campaign, 6 now appear in Harrods Hans Crescent windows: Jamaica’s fastest man alive, Usain Bolt, Football legends Diego Maradona, Jose Mourinho and Pele, as well as English FIFA World CupTM team manager Gareth Southgate and FIFA referee Bjorn Kuipers. Each champion was asked for their guidance on what it takes to become a champion and their inspirational quotes are featured within the three-dimensional and interactive windows. 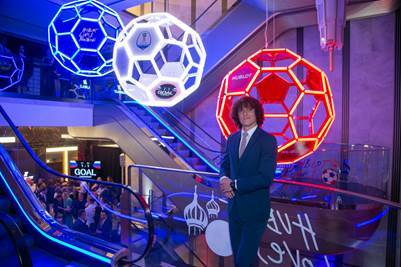 Following a FIFA World Cup™ themed cocktail reception, guests were accompanied to the Atrium illuminated in blue, red and white for the occasion. 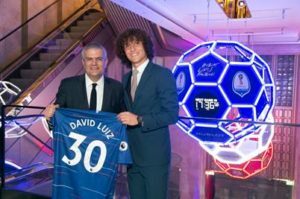 After discovering David Luiz as Hublot new friend of the brand, they were blown away by an high-octane performance – on Door 5 escalators – of “ProDance”, a multi-award winning Hip Hop dance crew.